Well it’s still mild and no real sign of winter on the way as yet, but if you listen to old tales, then we are in for a hard winter. This is on account of there being lots of lovely berries about. So while it’s not too bad out there why not venture out and see what takes your fancy? But if that’s a bit too energetic then here are a few plants that I think should not be missed. Callicarpa bodineri ‘Profusion’- the Beauty Berry. 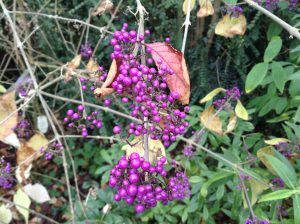 A really good shrub for its exquisite purple berries which last well into the New Year. It is quite big getting to about 1.8m x 1.8m (6 x 6ft). However, with a bit of pruning this can be kept under control. Pruning Callicarpa encourages more side growth development and therefore more berries with time. It likes good fertile soils which are not too dry and has quite good autumn colours. 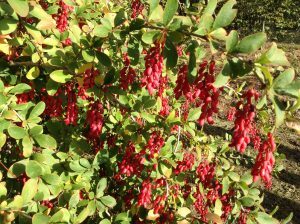 A large growing member of the Barberry family, Berberis ‘Georgei’ produces long racemes of yellow flowers in spring. 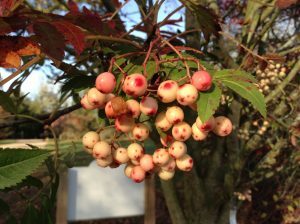 Later, the flowers (which bees seem to like) are followed by juicy dangling clusters of red fruits in autumn (as in the picture). Deciduous and spiny it is ideal for banks and drier areas and will tolerate some exposure. 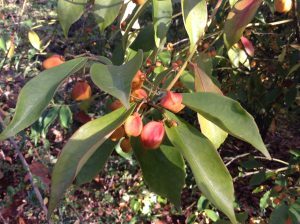 Euonymus myrianthus is very large shrub or small tree which has evergreen, long, mid green leaves. In spring it produces clusters of insignificant flowers which are followed by stunning orange and pink tinged seed capsules. These capsules contain pale cream seeds surrounded in a bright orange coating. It prefers to grow in partial shade but will tolerate full sun. The fruit casings hang on for most of the winter even once the seeds have been shed. Pyracantha ‘Saphyr Juane’ – Firethorn. One of the many forms of Firethorn which are often used for hedging and covering walls and fences. The saphyr series are known to be resistant to scab and fireblight which some of the older forms can get. Masses of pure white flowers are produced in spring followed by abundant fruits (this one is yellow but the others in the series are red or orange). 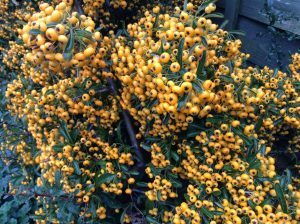 If you are into feeding your garden birds then a Pyracantha is a must as several of the Thrushes love the berries. Although if you prefer to keep your berries then know that the yellow tend to be the last to be eaten which means you have longer to enjoy them! A species of crab apple that gets up to 9m (30ft) and produces a lovely rounded habit. Pure white flowers are produced in abundance in spring which are followed by small cherry-like fruits. Fruit turn bright scarlet as they mature. The fruits last well into winter before they fall as they are pretty hard and need time to ripen. 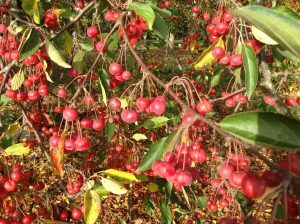 Malus ‘Comtesse de Paris’ – Crab Apple. 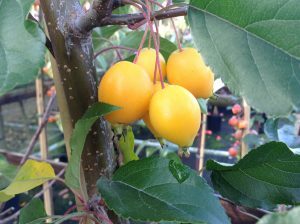 A beautiful yellow fruited crab apple that has oval fruits with a tapered base. These last on the plant up to Christmas or the middle of December if we have a lot of frosty weather. The flowers of this are pink tinged especially in bud and then they open out to almost pure white. Attractive to the bees and a good pollinator tree for dessert and cooking apples when in flower, it makes a good small tree for the garden getting to about 5.5m (18ft) but this can be reduced with good pruning. Certainly a popular one in the Plant Centre! 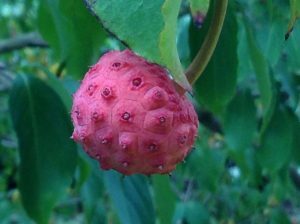 C. ‘Norman Hadden’ is an unusual fruited plant for this time of the year with these round fleshy hanging Lychee-like fruits. These are edible but don’t really taste of anything! A tall shrub or small tree getting up to 6m (20ft) and liking a cool moist root zone that is well drained and does not dry out in mid-summer. Masses of white bracts (flowers) are produced in June above rich green foliage. It will grow in full sun or dappled shade but does not want to be too exposed. A very good tree that has a very nice habit being quite upright when young but as it ages and produces berries the branches slowly relax forming a nice goblet shape. Masses of white flowers appear in the spring followed by berries that often start off a green-pink and fade to a lovely pale lemon, often with a few spots. The autumn colour is pretty good too! Turning rusty browns and oranges. Good on any soil as long as it does not sit wet in winter and dry out badly in summer. Bonfires – When we are cleaning up the garden some of us have a bonfire to get rid of the rubbish we have created. Before lighting this please check for Hedgehogs as they find these irresistible at this time of the year as they are now looking for places to hibernate for the winter. As it has been very mild of late they are still out and about so this could be more of a problem this year. Why not replace your bonfire with a snug hedgehog house in a quiet part of the garden? Bare Root Fruit and Hedging – November is traditionally the time to start thinking about getting fruit trees planted as the soil is still warm to enable establishment before the cold of the winter. Bare root hedging is also ideal for planting from mid-November onwards as long as the ground is not solid with frost. It’s always a good idea to get this done earlier rather than later when there are plenty of plants available. Need to start planting for the dry spells?? Would you like a swag of roses? Sign up to receive all the latest news, offers and events & garden open days. © 2019 The Place for Plants. All rights reserved.